If you people want to buy a guitar but you have a little amount of your hand. Don’t worry guys, and here we are providing one of the best guitars that help you to most. I have searched a lot of the websites on the internet and found one of the best guitars for the lowest price is the Jasmine S-34C Guitar. The superb and beautiful instrument that is the best creation of the team who produces the Takamine musical instruments. It has a quality that works in its material or the sound with the lowest cost. This guitar keeps it simple and the entry-level instrument that focuses on the new players. It has the slim neck and cutaway will appreciate by any of the aspiring guitarists. It mostly used for the entry-level people of the Takamine range. The Jasmine has a grand orchestra body style with the Venetian style. It is one of the laminate guitars with the spruce top and Sapele back and sides. The advanced X-bracing is used for the beneath the spruce top. It is having the feature full body binding and a natural satin finish. The length of the guitar is the 648mm, i.e., 25.5”. The Nato neck has a slim profile with a satin finish, and the rosewood fingerboard has the radius of 305mm, i.e.,12”. The synthetic bone of the guitar nut has a width of the 44mm. 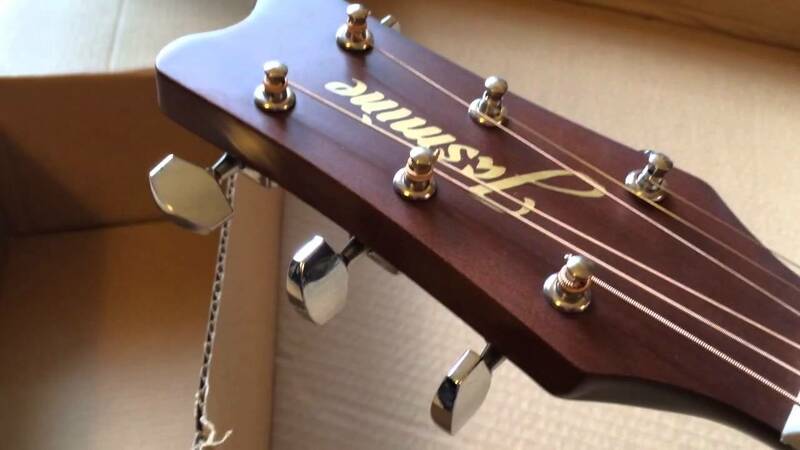 The headstock has a minimal design with the Jasmine name silk screened on it and the six chrome covered tuning machines. The bridge is made of the rosewood with a synthetic bone compensated saddle and the plastic bridge pins keep the strings anchored. The rosette is concentric circles. The pickguard is black and the 1-ply thick. Takamine Jasmine S34C NEX Acoustic Guitar has the unusual features that make the instrument an excellent musical tool. Check out the below features. The guitar having the Strong and coated top and also Nato back and sides. The overall look of the Jasmine S-34C is effortless, and no fancy embellishments give the guitar a very austere look. A straightforward way to increase the looks is to get rid of the pickguard that you can just peel up from the body. Some of the money will be spent on the setup of the guitar, and the action is adjusted, and a fresh set of the strings will do wonders for the using this instrument. It is the full sized device so those people having the small frames guitars may find the guitar too big. The neck of the guitar is lovely and feels very fast. The cutaway is good for the opening up the higher part of the strings. The sound of the guitar is jangly with the more presence in the upper registers. The presence is simple, and the undertones are not as detailed as on a more expensive guitar and not unpleasing to listen. The Slim neck with the satin finish feels very fast. The body has the cutaway opens up more of the fingerboard. Forest solid sapele is also used for the sides and back of the body. Will need a set up before it is taken home. The Jasmine S-34C is the perfect guitar for the beginners that gives the new player a platform and more focused on the basics. The neck is the most important part, and the S-34C delivers in that department.